Beautifully located in a secluded area along the rolling hills of the Ozarks mountains, Branson cabins at Thousand Hills are some of the best accommodations in the Midwest where you can experience luxury and comfort at affordable price. Branson cabins ensure guests a luxurious and comfortable living in a rustic and tranquil environment that cannot be experienced in regular hotel accommodation. The cabin rentals at Thousand Hills Golf Resort offer guests a wonderful stay with great features of modern amenities and stunning wildlife scenery. These cabin accommodations are just minutes away from famous city attractions and Branson’s entertainment district. While you’re enjoying a wonderful vacation and staying at Branson cabins, you are sure to feel a fascinating experience as you see the beautiful natural scenery, unspoiled wildlife, the crystal clear waters of the pristine lakes, and attractions in the surrounding area. Every cabin accommodation at Thousand Hills provides you a chance to enjoy a rustic experience and a great bonding moment with the whole family in a secluded place but actually near the heart of Branson. Your memorable stay at any of the cozy cabin accommodation at Thousand Hills Golf Resort gives you the chance to play golf at the nearby Thousand Hills Golf Course which features the most popular 18-hole golf course in Branson. In this golf course, you will certainly appreciate the beautiful landscape and the majestic rolling hills around the Ozark mountains. While you are enjoying your stay at the cabin accommodation at Thousand Hills, you will know the reason why many people visit Branson every year and choose to stay in a cozy cabin accommodation and want to come back again. Many of the visitors coming to Branson think that log cabins at Thousand Hills do not bring convenience and comfort. Not with Branson cabins as they feature beautiful designs with high-end amenities that include free wireless internet access, cable TV with HBO, DVD player, Jacuzzi tubs, and rain showers. These cabins also feature screened porch allowing you to enjoy the spectacular wildlife. 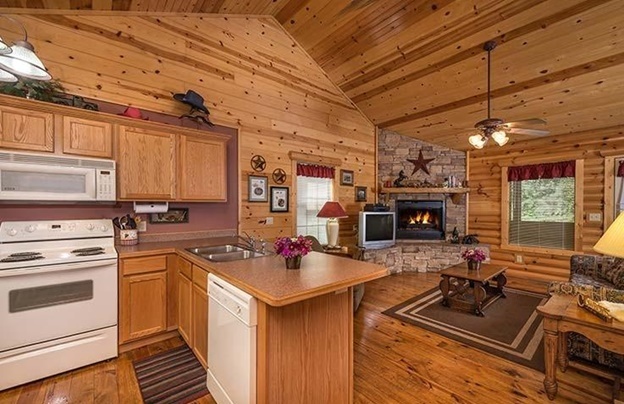 The kitchen of every log cabin is fully furnished with modern appliances, such as fridge, microwave oven, washer and dryer, dishes, pots and pans, and kitchen wares and utensils. As guest of the resort, you have the options to choose among log cabin units which sleep from 2 to a maximum of 16 people that range from 1 bedroom, 2 bedrooms to 4 bedrooms. The uniquely decorated and well-appointed Branson cabins at Thousand Hills offer convenience and comfort at lesser price compared to regular hotels. Recognized as one of the leaders in cabin rentals, Thousand Hills Golf Resort has been offering nightly rentals since the last ten years. Branson cabin accommodation which hasn’t been known for many years became known to visitors after many clients testified excellent services they have enjoyed. So, if you want to take a wonderful vacation this fall season in the Ozarks region, stay at Branson cabin at Thousand Hills where you can enjoy luxury at lesser price.